Groot Constantia’s revered history tells us how a man’s love of wine established the first wine farm in South Africa. By going back over 300 years, we come to understand how 891 morgen of land (763 hectares) created the origins of the South African wine industry, and how every owner thereafter contributed to what we know as Groot Constantia today. In 1685 Simon Van de Stel was granted the farm land which he named Constantia. He chose the location for its favourable soils and mountain slopes gently cooled by the ocean breezes of False Bay. Agricultural activities at Groot Constantia included viticulture, and the Constantia wines became renowned in Europe. In 1709 there were 70 000 vines on the farm and Van der Stel produced 5,630 litres of wine. During the years, ownership of Groot Constantia changed, but the legacy and supremacy of the wines produced remained. Simon van der Stel went onto become the first Cape Governer, a post from which he retired in 1699. On 24 June 1712 Simon van der Stel died at the age of 73. Then in 1714 Constantia was subdivided and sold by way of auction. Onwership of Groot Costantia changed many times, but the reputation of Grand Constance Wyn grew. Emperors and kings, from Frederick the Great of Prussia to King Louis Phillipe of France all vied for their share. Charles Dickens celebrated it in Edwin Drood, Jane Austen’s character recommended it as a cure for a broken heart to heroine Marianne Dashwood in Sense and Sensibility and Charles Baudelaire compared Constantia wine to his lover’s lips in his most famous volume of poems, Les Fleurs du Mal. Before his death in 1821, Napoleon had 30 bottles a month shipped over to St Helena to ease his exile. In 1976 the Groot Constantia Control Board was established to take charge of the viticulture on the farm. In 1984 Groot Constantia and Hoop op Constantia were declared National Monuments. In 1993 ownership of the entire estate was transferred from the government to an independent company, named Groot Constantia Trust. The main aim of the Trust is to preserve and maintain the cultural heritage of the estate for posterity. The trust is committed to maintain and restore this national monument which is South Africa’s oldest and best known wine estate. 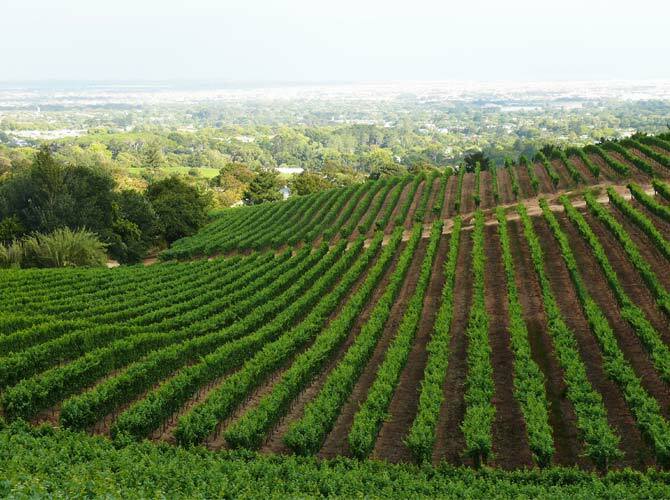 The Groot Constantia Estate is 60 – 280 metres above sea level, and 165 hectares in size with 90 hectares under vines. Red Wine comprises 70% of production, made up of Cabernet Sauvignon, Cabernet Franc, Merlot, Shiraz, Pinotage, Malbec, Touriga Nacional (Port variety), Muscat de Frontignan. White White 30% of production, made up of Sauvignon Blanc, Chardonnay, Semillon. 500 tonnes of grapes are grown each year which produces over 400 000 bottles. Highest average rainfall of all the South African regions with both good winter and summer rains. 1 100mm rainfall per annum 78% rainfall from May to October. No irrigation required. Nine different soil types exist on the farm and careful planning ensured the selection of the best possible clones of chosen varietals, in harmony with the specific slopes and soil types. Mostly Table Mountain Granite soils including Glenrosa, Hutton, Avalon and Oakleaf soils are found on the Estate. The alluvial soil types on the lower slopes of the farm provides interesting variation on varietal character, giving the winemaker the opportunity to create more complex wines through skillful blending. Groot Constantia is situated on the Cape Peninsula overlooking False Bay. The vineyards are tucked in the steep valley on the eastern side of Table Mountain. The area is blessed with a maritime climate due to the oceans on both sides and an annual average rainfall of +/- 1,100 mm per annum combined with cool southern slopes and deep mountain soils provides the ideal setting for the making of top quality wines. Each year Groot Constantia receives 300,000 visitors, and is one of the BIG 6 tourist destinations in the Cape, along side Table Mountain, V&A Waterfront, Cape Point, Kirstenbosch Botanical Gardens, and Robben Island. The wine has a deep ruby colour. It shows an abundance of ripe dark fruit on the nose, like blackberries and ripe cherries, backed by careful use of French oak barrels. Time in the glass also reveals undertones of fresh red fruit. The ripe black fruit follows on the palate, supported by firm yet fine tannin that promise good maturation potential. The wine is light straw-yellow in colour with a lime tint. Flavours of citrus, tropical fruits, gooseberries and hints of orange blossoms on the nose. Ripe summer fruit and mineral flavours combine with a citrus acidity on the aftertaste. Aromas of summer fruits, black currant, cassis, fennel and hints of cigar box underneath. The palate has a good flavour concentration backed by classical Cabernet tannins to ensure a long lingering aftertaste. The wine shows fresh fruit in its youth, but will benefit from some aging. A multi layered Merot that shows flavours of mulberry, raspberry, plums and hints of spices on the nose. Berry fruit like black currant and mulberries follow on the palate. Fine tannins give structure and length to the wine that finishes with great concentration and weight. This opulent Shiraz has a deep, dark, almost black colour. In a style, typical of Constantia Shiraz, its nose is aromatic and shows nuances of black currant, cracked black pepper, liquorice and violets. Beautiful rick, ripe flavours follow through on the palate. This bold red has fine tannin which allows from drinking well in its youth but also has the potential to mature with time. With its deep, dark, nearly purple red colour this wine explodes with the scent of bright red fruit, black berries, liquorice, cinnamon and spice on the nose. The black fruit and spice follow through on the palate showing an abundance of fruit flavours and fine tannin and has a beautiful long finish. This Pinotage is very drinkable in its youth, but will age gracefully if stored correctly. The wide range of grape varieties used in this Cape Blend gives the wine amazing complexity. 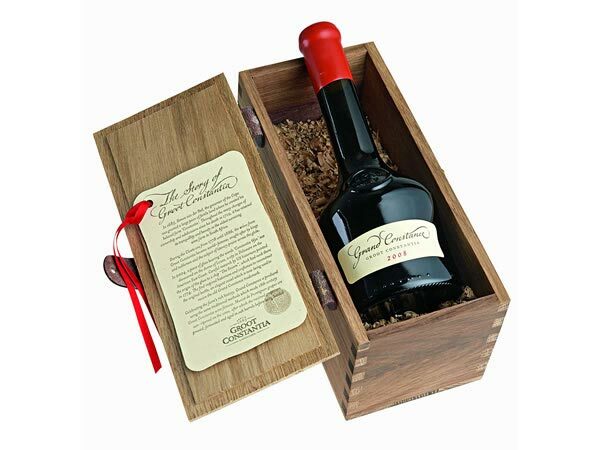 The flavours range from aromatic mint and black pepper to red cherries and strawberries on the nose, all framed by the careful use of French oak barrels. The spice and fruit follows beautifully on the palate, while the elegant tannin structure promises good maturation potential. The 2014 Sauvignon has a pale straw colour with a lime green rim. On the nose it shows an abundance of ripe summer fruit like passion fruit, sweet melon and white peach mixed with herbaceous and green pepper aromas. The sweet summer fruit gives richness to the palate, beautifully balanced by a crisp, fresh acidity. Aromas of tropical fruits like granadilla, pineapple, spanspek, ripe mango and pears are balanced by hints of white pepper and mineral flavours on the nose. The tropical fruit flavours follow through on the palate with hints of lemon on the aftertaste. A fruity wine in its youth that will show a lot of complexity with a bit of bottle aging. The wine has a beautiful light salmon colour. It shows floral characteristics and a lot of ripe summer fruit like pear and peach on the nose. The ripe fruit follows in the mouth; the wine has good flavour and a gentle acidity on the palate. The wine has an intense liquid amber colour. On the nose the wine has typical Muscat characteristics and is enhanced by nuances of pears, apricots, peaches, rose petals and nuts. A crisp acidity balances out the sweetness perfectly. This wine has amazing ageing potential but can also be enjoyed at a young age.